I’ve said it before and I’ll say it again: I am not the craftiest mom. I like to knit and sew, but I usually take those interests as opportunities to get a break from being mom. Crafting with kids does a real number on my patience. But it’s worth it to make crafts with children. It teaches them to produce their own artwork, it helps them to improve fine motor skills, and it helps me to become a more patient mom – something I desperately need. I’ve been working on adding more crafts into our kids’ lives. For me, that means looking for the simplest, easiest projects I can find – especially with four kids getting involved! 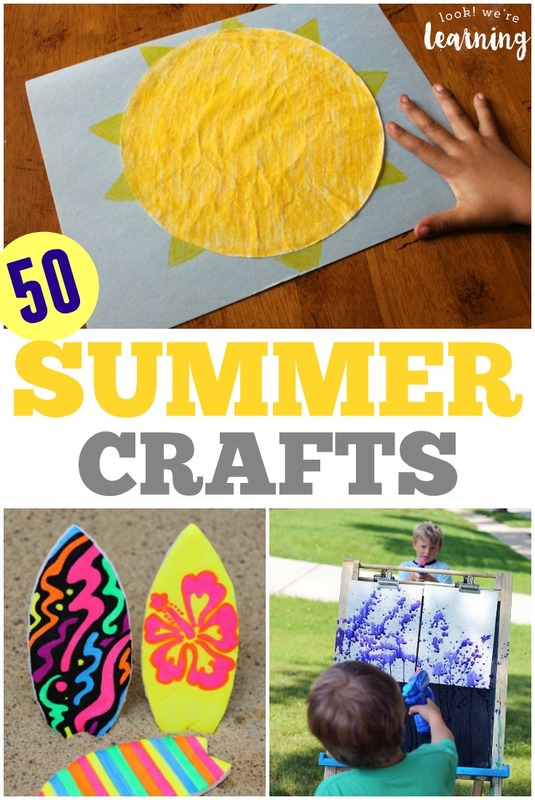 And that’s why I’ve rounded up this list of 50 easy summer crafts for kids! These are all summer-themed, so they’re a great fit for any summer unit studies you’ll be doing! Plus, there are ideas for kids of all ages, including summer crafts for preschoolers and summer crafts for tweens! If you love these, don’t miss this list of beach crafts for kids or this roundup of more simple summer crafts kids can try! 1. Coffee Filter Baseball Craft -Look! We’re Learning! 15. DIY Play Beach Sand – Look! We’re Learning! See more awesome summer crafts for kids on page 2!